Amazon.com Price: $12.94 (as of 2019-04-21 18:30:24 GMT) Product prices and availability are accurate as of the date/time indicated and are subject to change. Any price and availability information displayed on Amazon.com at the time of purchase will apply to the purchase of this product. Nominated for 70 ‘Game of the Year’ Awards, the NBA 2K franchise returns with NBA 2K15, our most true-to-life NBA experience yet. 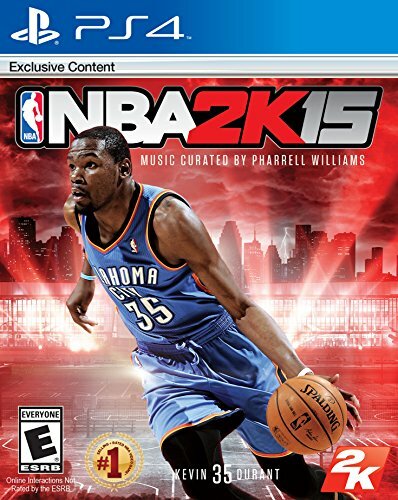 Featuring NBA MVP Kevin Durant on the cover and an eclectic soundtrack curated by internationally-renowned artist and producer Pharrell Williams, NBA 2K15 hits the court with unprecedented life-like graphics, ultra-realistic NBA gameplay, and more. It’s up to you to claim your destiny. Gameplay: NBA 2K15 features a number of significant gameplay improvements, including approximately 5,000 new animations, all-new defensive AI, shooting systems, new team-specific play sets, and more control over rebounding, steals, and blocks making players feel engaged in every basketball decision and action. Upgraded broadcast-style presentation hosted by Ernie Johnson and Shaq delivers authentic commentary and analysis to the action.